The Spanish Independent Authority for Fiscal Responsibility (known in Spanish as AIReF) has chosen OECD to make a report that will analyze and evaluate its activities and organization from its very foundation. On this opportunity, Santiago Lago-Peñas, a professor at the University of Vigo and director of GEN was named as an external associate to the OECD. Besides him, OECD will include two members of its Directorate for Public Governance as well as members of other independent fiscal institutions. OECD’s reference in this external evaluation will be the work of other Independent fiscal institutions in the EU countries. AIReF has invested 60.000 euros in this evaluation whose results should be presented by the 30th of November this year. These kind of external and independent evaluations are a well-established practice among public institutions and are, in fact, recommended by international organizations. The Spanish Council of Ministers has established two Expert Commissions to review the models of funding the autonomous regions and local funding. The objective is to boost the updating process of the current funding systems. Santiago Lago Peñas, director of the GEN Research Group, has been named member of the Expert Commission that will review the autonomous funding model. He has been named by the Galician government as their representative in the matter. The mission of both Expert Commissions will be to review and analyse both systems. Moreover, they will have the task to design two new models which should be based on the principles of solidarity, sufficiency, equity, transparency, fiscal responsibility and the guarantee of access to public services. The latest publication of the BRQ Business Research Quaterly Journal, num. 19(04) includes an article titled “On the relationship between corporate governance and value creation in an economic crisis: Empirical evidence for the Spanish case”. This article was written by Santiago Lago-Peñas, Elena Rivo (both GEN researchers) and Mónica Villanueva-Villar (University of Vigo). This paper analyses the effect of corporate governance on value creation. It relies upon a dataset that includes the companies listed on the Spanish Stock Exchange for the period from 2005 to 2012. Attention is focused on the structure and composition of boards. In particular, four variables are analyzed: the size, independence of board members and their diligence (measured by the number of meetings), and the duality between chairman and chief executive officer. Over the period of the deepest economic crisis (2009–2012), the most significant variables that had a positive effect on value creation were independence and size. Hence, the global financial crisis has highlighted the need for effective corporate governance. Policy makers should think about translating the recommendations of the Good Governance Codes into legislation (mandatory), to improve corporate governance. 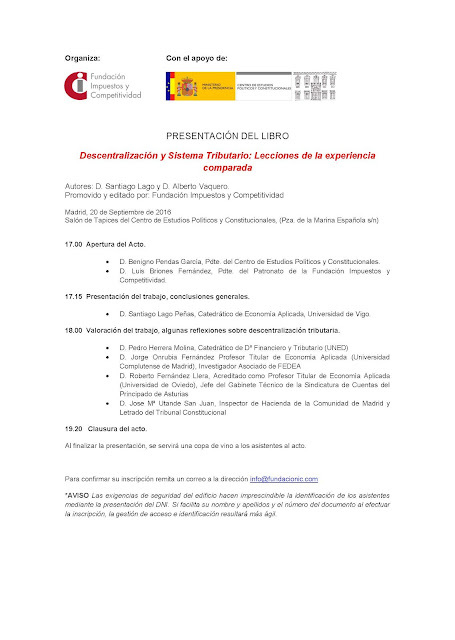 On Thursday 29 will begin the 13th PEARL Seminar at the Consello Económico de Galicia (CES Galicia) in Santiago de Compostela. For the first time, this event is organized in Spain. Past editions were held in France, Italy, Switzerland, Czech Republic, Finland and China. PEARL is a network of researchers and research institutions that operate in the field of applied public economics and public finance. The main focus of the network is on the regional level of government, which of course includes studying the relationships with local, state, federal (or supra-national) institutions. The idea of PEARL is to gather various kinds of expertise both from different countries (implying different objectives, economic and institutional constraints) and from different fields of economic analysis (econometrics, public finance and public choice, local and regional economics, macroeconomics). "Descentralización y Sistema Tributario: Lecciones de la Experiencia Comparada"
The book "Descentralización y Sistema Tributario: Lecciones de la Experiencia Comparada" will be presented today at 17:00 in Madrid (Centro de Estudios Políticos y Constitucionales). 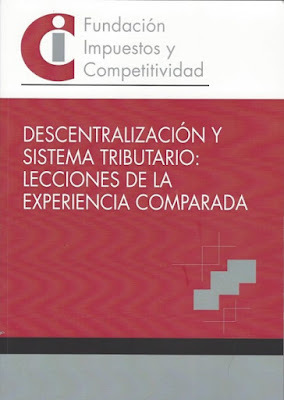 This book is written by Santiango Lago Peñas and Alberto Vaquero García, both members of GEN, and it is edited by "Fundación Impuestos y Competitividad". In the collaboration with the Galician Football Association, GEN is launching the Galician Sports Betting. This pioneer initiative in Spain has the objective of creating new incomes for the Galician Football, boosting its image and improving the positioning of the local football clubs. According to the estimations, this system will generate between 2.4 and 10.2 millions of euros in annual incomes. The sports betting system will consist of a weekly bet on thirteen matches, a bet to an additional game (the jackpot system) and one more bet for the first nine games. Each betting slip will include nine matches of the Third Galician division, two games of the First Female Division and two games of the Regional Division. This initiative, which will combine a paper betting slip with the electronic betting, will commence trial from the season 2016/2017. Statistics confirms what football supporters suspected, Carlos Lago (GEN Uvigo) and Maite González (European University of Madrid) have made a study where they analyze all La Liga matches during the 2014-2015 season. They have found that the greater the difference in the score, less additional time is added to the end of the game. In their study "The Influence of Referee Bias on Extra Time in Elite Soccer Matches", published in the “Perceptual and Motor Skills” journal, the researchers have found that referees give advantage to the big teams by shortening the added extra time when they are ahead on the scoreboard. However, If they are losing the referees would slightly lengthen the game. Their study was based on 380 matches played in the Spanish First League, considering other variables (goal difference, number of red and yellow cards, changes, assists and fouls). After applying linear regression it was observed that the greater the difference in the score, the lower the additional time was granted by the referee. There is also a bias that favours local teams, as the pressure of spectators manages to make the referees to add up to 112 seconds to the usual extra time in the cases when the home team is losing. According to the interview with Carlos Lago, these actions have not been shown to be malicious, but simply human decisions. To avoid this, he recommends better training of referees and avoiding subjectivity.